Chloe had lived less than a mile from the sea her entire life but had never been to the beach. She had a learning disability, anxiety and difficulty concentrating at school. "Many children have heavy burdens to bear that most of their peers have no idea about and little time to develop friendships. Being singled out as worth something, having time spent on them isn’t something they are used to and would benefit children like Chloe in so many ways," explained her teacher to us. 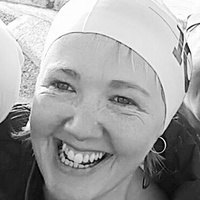 With a huge grin on her cheeky face she struggled out of her wetsuit following a surf session proclaiming loudly, "That was literally the best day of my whole life. Ever !" After taking a few sessions in the sea, Chloe's teachers reported a positive impact on her concentration and general well being, with improved confidence being the most notable impact. Whilst there are undeniably affluent areas of Sussex, there are also pockets of real deprivation. Mental-health and social isolation are problems faced by many young people. The emotional well being of children is equally, if not more, important as their physical health. It allows them to develop the resilience to cope with whatever life throws at them and grow into well-rounded, healthy adults. Swimming, surfing or just bobbing about in the waves is first and foremost great fun and lifts the spirits. It is a proven tool to deal with emotional difficulties and social exclusion. However, those who most need it are the least likely to be able to afford or access such activities which support emotional well being. 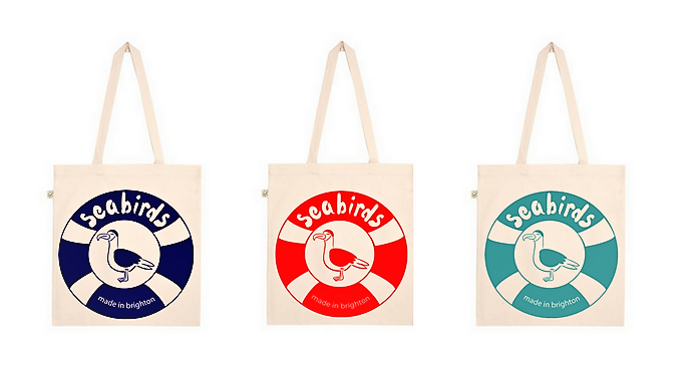 Seabirds social enterprise will design and sell beach and sea-themed clothing online. Products will be ethical and affordable with profits donated to our partner charity, Surf Solace. With this initial seed funding we will develop a sustainable income stream for Surf Solace to fund free activity courses in the sea for vulnerable children and young people. Sessions will be delivered with 1:1 support from volunteers, using methods which have proved highly effective at improving health and well-being outcomes for vulnerable young people. An initial pilot course will act as a springboard for more courses, enabling more young people to be reached. We need to raise £3000 to launch Seabirds Ltd. With this seed funding we will start to buy products to sell and pay for our website. Help us get off the ground! We will build an ethical social enterprise that enables us to fund Surf Solace from the profits. We will work tirelessly to ensure more young people benefit and spread our love of the sea. Thanks entirely to the overwhelming generosity of our supporters, we have almost manged to hit our initial target in the first week! As we have 21 days left to run our campaign we've decided to extend our target by an extra £1000 to £4000. With these extra funds we will buy an all-weather, branded gazebo which will provide warmer and more secure changing and training facilities on the beach for the children's surf therapy sessions. Thank you so very much and please keep sharing and supporting us! And here’s some amazing perks for supporting us that you just can’t live without! Domestic postage is included in the price. At checkout there is a small, compulsory, payment-processing charge which goes to Chuffed and a request for a voluntary donation to Chuffed. You can of course edit and select £0 if you wish but bear in mind that Chuffed are a charity, don't charge us to use their platform and we wouldn't be here without them. Please note that you can only make one choice of product each time - in separate transactions. Help us get more children into the waves! We want to support Surf Solace, a local charity, that takes anxious, depressed young people into the sea. Result: happier and more confident kids - it works! 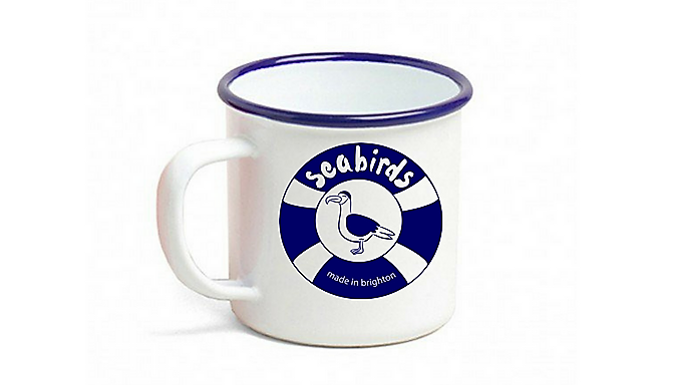 Beautiful Retro Enamel Cup in navy and white, with Seabirds Logo. Avoid plastic and take with you camping, picnics and to the beach. 100% cotton tea towel. 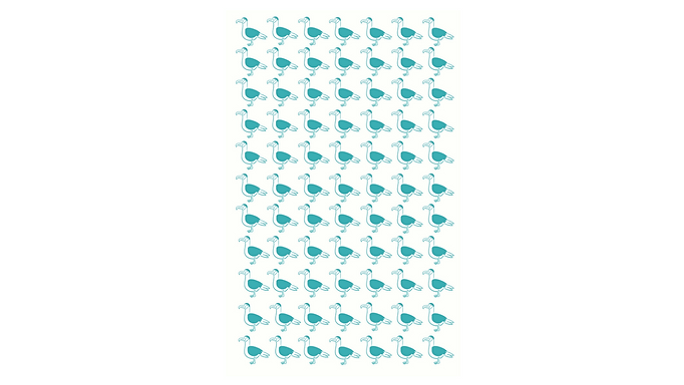 Printed with turquoise Gertie the seagull design. Est. Delivery Date: within 1 month of Chuffed Campaign completion. * £60 in offline donations included in total.